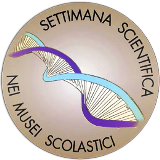 For the occasion of the Scientific Week 2019, organized by MUSIS, the immersive installation Harmonic Fermions by Paolo Monti 37788, curator Piero Pala, is open to the public at the Liceo Pilo Albertelli Museum. The installation consists of a wave-front generated by a video source, which propagates images of wave-like perturbation, projected from the rear of a completely reflective tunnel. The videos shown are selected from those produced by Monti in a lustrum of research focused between Art and Science, where the use of technology is tightly interconnected with the idea that substance and commitment vary from the most prosaic to the most advanced. The videos used in the exhibition are made using infra-red thermal cameras, self-regulating analyzers at various luminosities, optical 3D Epi-coaxial microscopes, satellite detectors linked to the orbit of his orbiting gallery Galleria Orbitante EduSat-Gauss-ASI 37788 up to the dynamic fractal sequences realized in analogue where the sequence of self-generating processes reproduce harmonic feedback between coherent oscillations of sound and light waves. The video sequence is synaesthetically paired with fonts of sound especially composed both as in Fronte d’Onda (Wave Front) by Maurizio Martusciello (2004) and through the choice by election of pieces like Music is Not Music by Alvin Curran (2007) or, in the case of Riccardo Giagni who freely chose some of his own work and that of others for the video Dune Sand-Pile (2002), with words taken from the work of Gregory Bateson and narrated by Rosalba Conserva. Inside the tunnel visitor/participants, wearing a Mylar mirroring cloak, are enveloped by the propagation of images on the cloak’s reflective surface: an interactive context where the visitor/participants play an active part and are integrated in the installation itself. In this dance of photons every experience becomes personal and the work generates as many points of view as the visitor/participants who interact. The inside of the tunnel is filmed using closed-circuit cameras that record the variations of the lighting system through the interaction of the photons with the visitor/participants. Paolo Monti’s work offers continual exploration between Art and Science with the intent to transform physical events into visual/tangible work using technical-scientific instruments which combine biology, science of the matter, physics and chemistry with artistic experience and, the observer who being actively involved, becomes the subject able to modify such. Systemic work obtained through generative and self-generating processes where the extent of the systemic prospective of Gregory Bateson is of reference in the plurality of the languages used. All meetings are open to the public and will involve teaching staff from the Lyceum in the discussions, together with persons who, in various capacities, have contributed to this remarkable research.